Grit cakes are without a doubt one of the most versatile dishes that exists. They can be served for breakfast, lunch, dinner, or just a snack, and are delicious no matter how you serve them. Think of them as the English muffin for Eggs Benedict, the tortilla for Huevos Rancheros, the dough for pizza, the base for sautéed vegetables, the...you get the idea! Suffice it to say, they can be enjoyed numerous ways, so tap into your culinary creativity and give this grit cakes recipe a try. We’d love to see what you come up with! Be sure to share this recipe, which makes about 8 cakes, with family and friends on Facebook, Pinterest, Instagram, and Twitter. Making these grit cakes only takes about 10 minutes of prep time and 20 minutes of cooking time! Begin by whisking 1 large egg in a bowl, then whisk in ½ cup half-and-half (or milk) and set aside. Next, bring 3 cups of water to a boil in a heavy-bottomed pot or large saucepan. Add 1 teaspoon of salt and stir in 2 cups “instant” grits, whisking constantly. Remove from heat. Whisk about 1 tablespoon of hot grits into the reserved egg-milk mixture until well combined. Slowly whisk this mixture back into the rest of the grits until everything is well blended. 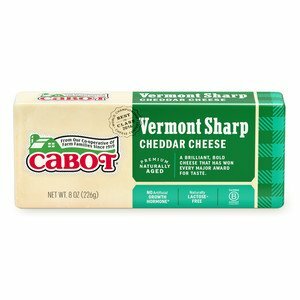 Stir in 4 ounces grated Cabot Sharp Cheddar Cheese. Spoon grits into a greased 13-by-9-inch dish, smoothing with spatula, and let cool to room temperature. Cover with plastic wrap and refrigerate until firm, for several hours or overnight. 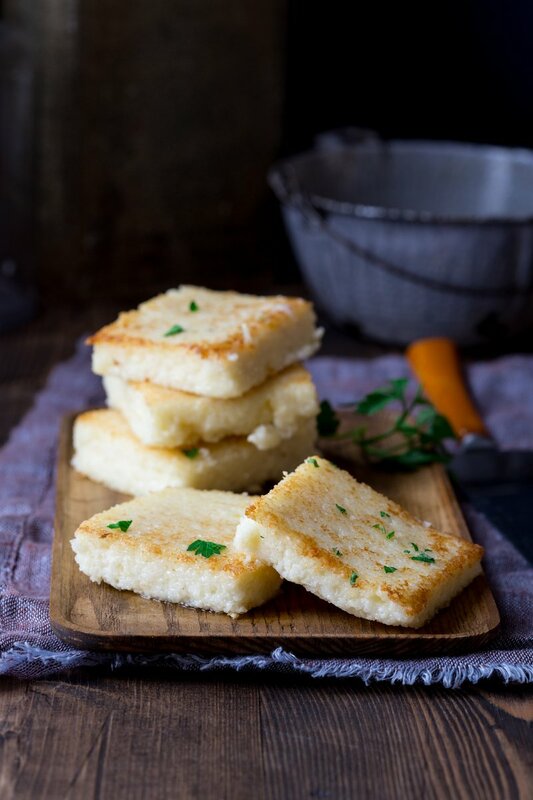 Once firm, cut grits into squares or triangles. In a large cast iron skillet, heat about ¼ inch of vegetable oil over medium-high heat. Add grit cakes and cook until golden on both sides, approximately 4 minutes per side. As an alternative, you can brush cakes with the vegetable oil or melted butter and broil or bake them until they are browned and crispy. Want another great recipe for grit cakes? You’ll love our Mediterranean Grits, made with delicious ingredients such as sundried tomatoes, basil pesto, kalamata olives, and Cabot Garlic and Herb Cheddar Cheese. Cabot is a cooperative of over 800 farm families and has been producing award-winning dairy products for many years. We’d love to hear your feedback on these cheddar grit cakes, so please rate and review the recipe after you’ve tried it! WHISK egg until combined in a small bowl; whisk in half-and-half or milk and set aside. BRING water to boil in heavy-bottomed pot or large saucepan. Add salt; whisking constantly, stir in grits. Remove from heat. WHISK about 1 tablespoon of hot grits into reserved egg-milk mixture until well combined. Slowly whisk this mixture back into grits until well blended. Stir in cheese. SPOON grits into greased 13-by-9-inch dish, smoothing with spatula. Let cool to room temperature. COVER with plastic wrap and refrigerate until firm, several hours or overnight.